In our local area, similar to places around the world, there is an overpopulation of homeless pets. You, however, can help. 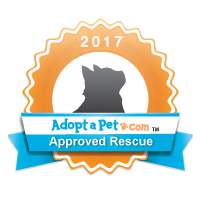 One way to start putting an end to pet overpopulation is to adopt your next pet from our rescue group. By doing so you immediately give a home to a cat that didn't have one, and you reduce the overall number of homeless pets out there. Explore our site to learn more about the adoption process. You'll discover the advantages of adopting rather than buying your cat, and hopefully find a cat that is just right for you. I’ve heard about what you’re doing and want to help. I am reaching out to you on behalf of the Wag! Charity Affiliate program. We are currently partnering with charities like yours to provide recurring donations and to reach our goal of donating 1,000,000 meals to shelter dogs. Triad Independent Cat Rescue will receive an initial donation of $25 by simply adding the charity pod to your site. I have included the script below that can be sent directly to your webmaster for placement.